This survey demonstrated that patients of chiropractors were three times as likely as patients of family physicians to respond that they were satisfied with the care they received for low back pain. Chiropractic patients were also more likely to have been satisfied with the amount of information they were given and to believe their doctors were concerned about them. This study was conducted at the Group Health Cooperative of Puget Sound, a 40-year-old staff-model Health Maintenance Organization (HMO) in western Washington State with 32,000 enrollees. The percentage of chiropractic patients who were very satisfied with the care they received for low back pain was triple that for patients of family physicians (66 percent versus 22 percent). Patients of family physicians were significantly less likely to report having received a graphic description of the causes of low back pain or instruction on exercise, posture and lifting techniques. We compare health maintenance organization enrollees' evaluations of the care they received from family physicians and chiropractors for low back pain. Patients of chiropractors were three times as likely as patients of family physicians to report that they were very satisfied with the care they received for low back pain (66% versus 22%, respectively). 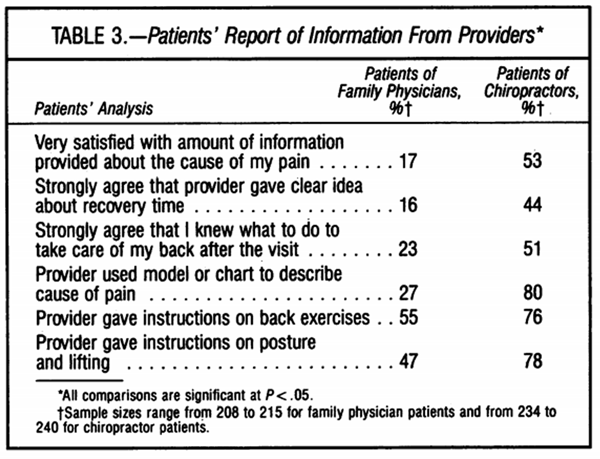 Compared with patients of family physicians, patients of chiropractors were much more likely to have been satisfied with the amount of information they were given, to have perceived that their provider was concerned about them, and to have felt that their provider was comfortable and confident dealing with their problem. Although the more positive evaluations of chiropractors may be related to differences in the patient populations served by the two providers or to benefits of spinal manipulation, it is suggested that a potentially more potent force--the therapeutic effect of the patient and provider interaction itself--may explain the observed differences. Although most persons seeking care for low back pain consult doctors of medicine or osteopathy, a large proportion ofcare is provided by chiropractors. In 1980, 40% ofAmericans with chronic back problems sought care for their backs from allopathic and osteopathic physicians, while 30% consulted chiropractors. In spite of the important role that chiropractors play in caring for patients with back pain, there is little information in the medical literature about how physicians or chiropractors actually manage patients with back pain or about the relative cost or effectiveness ofchiropractic care versus allopathic or osteopathic care for this problem. We have previously reported that family physicians and chiropractors differ greatly in their beliefs about back pain and in their clinical responses to patients with back pain. In this article we compare patients' evaluations of their care from family physicians and chiropractors. This study was conducted at the Group Health Cooperative of Puget Sound, a 40-year-old staff-model health maintenance organization (HMO) in western Washington State with 320,000 enrollees. Primary care is provided almost entirely by family physicians and pediatricians practicing in 20 medical centers in the Puget Sound area. Enrollees generally have a personal physician from whom they receive their primary care. About 60,000 enrollees younger than 65 years have an insurance benefit that covers up to $200 per year in chiropractic services without requiring a physician referral. Because the HMO does not have chiropractors on staff, chiropractic services are obtained in the community. To gain an initial appreciation of the range of experiences, attitudes, and perceptions of patients with low back pain, we first convened discussion groups consisting of a random sample of the HMO's enrollees who, according to records, had visited a family physician or a chiropractor for low back pain within the previous year. Of the 32 patients asked, 20 agreed to participate in the discussions. While the discussions focused on patients' initial experiences with care from a provider, expectations of the provider, and self-care, patients were encouraged to describe any other aspects of their back care that they thought were important. Proceedings were audiotaped, and transcriptions were reviewed by the investigators. The most notable findings were the importance to many patients of having a provider who conveyed adequate information about their problem, who believed that their pain was real, and who showed concern. Survey questionnaires were then designed that addressed the main issues identified in the discussion groups, as well as issues that arose in discussions with groups of family physicians and chiropractors. 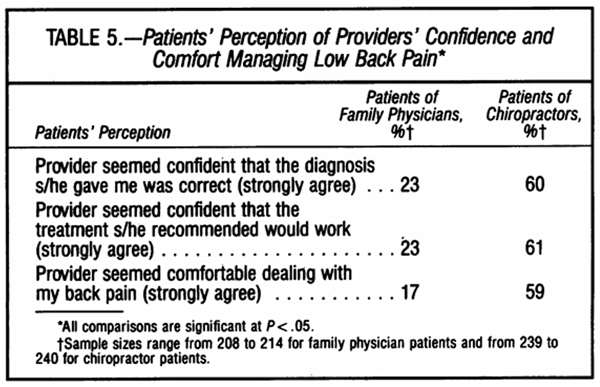 The questionnaires included items about the patient's perceptions of the provider's concern, understanding, and skill in providing care for low back pain, the information they were given by the provider, and their satisfaction with the process of care. In addition, patients were asked how many days of restricted activity they had experienced, how satisfied they were with HMO providers for treating problems other than low back pain, and how they rated themselves on a standard four-point health status scale. Questionnaires sent to patients of family physicians and to patients of chiropractors were identical except for response options that were not applicable to both types of providers, such as chiropractors not being asked if they had prescribed drugs since they cannot legally do so. Questionnaires were pretested on a convenience sample of persons who had received care from family physicians or chiropractors for back pain. The sampling frame for patients of family physicians consisted of all 718 enrollees between 18 and 64 years of age who, according to appointment logs, had seen any of 181 family physicians at Group Health Cooperative for a back problem between April 1 and April 15 of 1986. A simple random sample of 50% (359) of these patients was chosen to be surveyed (Table 1). The sampling frame for chiropractor patients consisted of all 348 enrollees between the ages of 18 and 64 who had a chiropractic insurance benefit and who, according to billing records, had visited a chiropractor for a back problem between April 1 and April 15 of 1986. All 348 chiropractor patients were surveyed. Two enrollees who appeared in both samples were asked to complete only the chiropractor questionnaire. Children and older adults were excluded to minimize the number of enrollees in the sample with congenital anomalies or low back pain associated with degenerative diseases such as arthritis. Because the location of enrollees' back pain-low back pain versus mid- or upper back pain, for example-could not be determined from the sampling frames, this was accomplished in the course of the survey conducted during the fall of 1986, about eight months after the visit. Almost a quarter of the enrollees surveyed claimed that their visit in April of 1986 had not been for low back pain (Table 1). Most of these enrollees reported that their pain was in the mid- or upper back, shoulder, hip, or neck. Because the focus of this study was on low back pain, the 80 family physician patients and 87 chiropractor patients who claimed to have experienced some other type of problem were excluded from the study. An additional 13 patients were excluded because they had recently disenrolled or died, leaving 268 family physician patients and 257 chiropractor patients with acknowledged low back pain in the final sample. 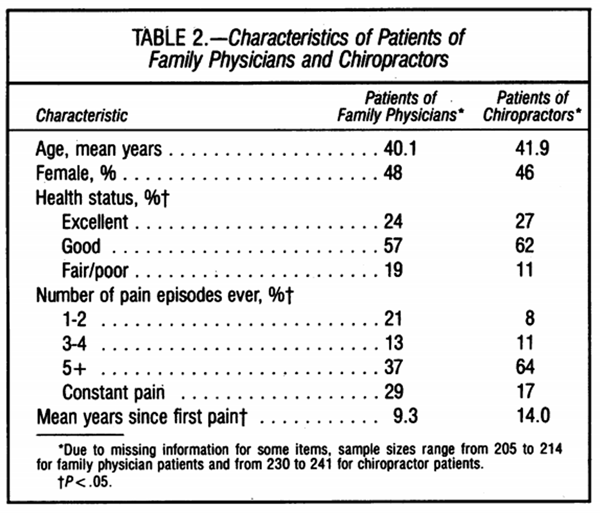 After two mailings and repeated efforts to telephone persons not responding by mail, usable responses were received from 215 (80%) of the family physician patients and 242 (94%) of the chiropractor patients (Table 1). Although the rate of outright refusal was similar in the two groups (3 % to 4%), patients of family physicians were more likely than patients of chiropractors to have unknown telephone numbers and to claim they had returned completed questionnaires that, in fact, were never received by the study staff. Patients were asked to evaluate various aspects ofthe care they received from family physicians and chiropractors using symmetric five-point Likert scales with response options ranging from very satisfied to very dissatisfied or strongly agree to strongly disagree. Because a skew toward the favorable response categories that is typically found in studies of patient satisfaction was evident in this study, we decided to present the results in terms of the proportions of respondents who were "very satisfied" or who "strongly agreed." The overall results would have been generally the same, though less discriminating because of the ceiling effect, had we incorporated the "satisfied" and "agree" responses into the measures we presented. The x2 test was used to test for differences between proportions, and Student's t test was used to compare differences between means. The standard criterion for statistical significance (a = .05) was used. Persons who sought care for low back pain from chiropractors rated the care they received much more highly than persons who sought care from family physicians. Patients of chiropractors were more likely than patients of family physicians to have been satisfied with the information they were given about their problem, to have perceived that their provider was concerned about them during and after the visit, and to have felt that their provider was comfortable and confident in managing low back pain. Patients of chiropractors were also more likely to report that they would return to the same provider for care and were less likely to report that there were things the provider did not do for them that would have helped. Patients ofchiropractors also reported far fewer days oflimited activity due to their back pain. We do not know why individual patients selected a particular provider or whether patients had different expectations about the ability of each type of provider to help them. We presume that enrollees who chose to see chiropractors did so because of an expectation that their needs were more likely to be met by a chiropractor than by a family physician. But what about enrollees who chose to see a family physician even though their insurance covered chiropractic services? One would expect the 54 enrollees in this group to have been more satisfied with their care from family physicians than were enrollees whose only option in terms of insurance coverage was to see a family physician. In fact, we found the responses of the enrollees in these two groups to be virtually identical. This suggests that the more favorable views about chiropractors do not merely reflect the benefits of being able to select the type of provider that one expects to be the most helpful. Practice setting differences, with the family physicians being on salary within a single HMO and the chiropractors in fee-for-service practices, could also have influenced the findings. A fee-for-service practice provides different incentives than a salaried practice in an HMO for scheduling return visits, ordering tests, referring patients to specialists, and possibly for length of visit. In addition, therapeutic options such as physical therapy may be more readily available within an HMO system than they are in most fee-for-service practices. Nevertheless, family physicians in fee-for-service practice and in HMOs have been shown to have generally similar beliefs and behaviors related to the management of low back pain.4 Hence, it is unlikely that practice setting differences alone are responsible for the large differences that were observed between family physicians and chiropractors. Probably the most profound difference between chiropractors and family physicians is their training and consequent beliefs, attitudes, and behaviors concerning the management of low back pain. Chiropractic training focuses on the spine and emphasizes a particular therapeutic technique-spinal manipulation-while family physician training covers the entire spectrum of clinical topics and does not emphasize the paramount importance of a particular therapy, even for back pain. Chiropractors generally believe that most back pain is caused by anatomic derangements in the spine, such as vertebral subluxations, that can be identified on a spinal radiograph and effectively treated using spinal manipulation. In contrast, family physicians believe that most back pain is caused by muscle strain, that spinal radiographs are rarely useful, that appropriate therapy does not depend on a precise diagnosis, and that patients will get better without professional help. These differences may explain why family physicians are more likely than chiropractors to feel frustrated by back pain patients, less likely to think they can help prevent future episodes of back pain, and less confident that their back pain patients are satisfied with their care. The results of this study suggest that patients may be more satisfied with the confident and definite approach ofchiropractors than with the less certain and more scientific approach of family physicians. Other factors, such as possibly longer visits with chiropractors than with family physicians, could also explain differences in patient satisfaction. There are many differences between family physicians and chiropractors that could explain the observed differences in patient satisfaction, and it is not possible from this study to determine with certainty which might be the most important. The most clinically relevant question for patients and physicians, however, is whether patients' more positive evaluations of chiropractors result from specific benefits of spinal manipulation or from other aspects of the interaction between patient and provider. Although studies of spinal manipulation for back pain have generally found that it provides more immediate relief of back pain than other methods with which it has been compared, [10, 11] other differences between the chiropractic and medical approach to low back pain could conceivably have a more potent effect on patient outcomes. The science of medicine may not provide physicians with tools that are generally effective for managing back pain. Although particular therapies, such as spinal manipulation, may in fact be effective for some patients, there is reason to think that other aspects of the patient-provider interaction may have a greater influence on the outcome of care. Greater consideration should be given to the potential for the art of medicine to provide low back pain patients with effective therapy. A critical look at the treatment for low back pain. Roentgenograms in primary care patients with acute low back pain-A cost-effectiveness analysis. National Center for Health Statistics, Public Health Service. Manipulating the patient - A comparison of the effectiveness of physician and chiropractor care. of Health and Human Services (DHHS) publication No. (PHS) 84-20206. The chiropractic physician-A study of career contingencies. Social origins and ideology of chiropractors: An empirical study of the socialization of the chiropractic student. Conservative therapy for low back pain - Distinguishing useful from useless therapy. Adjustment, the hands and healing. The physician's actions and the outcome of illness in family practice. General practice consultations - Is there any point in being positive? Therapeutic aspects of the clinical encounter.